Today I’d like to take a moment to point out a few easy ways to help the planet and yourself at the same time. I’ll define easy as taking less then half an hour, and I promise all of these will save you money. Check them out after the jump. Switch to compact fluorescent bulbs. I’m sure you’ve seen them. They’re even kind of cute, right? The benefits are many and the costs few. This is an easy change because you don’t necessarily need to change right away. Just reach for these the next time a light burns out, and enjoy the rewards. Ecological Savings: Up to 2,000 times the bulb’s weight in greenhouse gases over it’s life. Economic Savings: Estimated $30 electricity costs over the bulb’s life. I’ve heard figures that compact fluorescent bulbs use only 30% as much energy as standard bulbs. Disclaimer: Australia and Canada are way ahead of me on this. They’re both working to ban incandescent bulbs completely. Kill the junk mail. It’s easier then you think, and it not only saves trees, but will save you from temptations like “low-interest credit cards” and catalogs. This is a great place to start, and all the solutions are quick. Ecological Savings: No trees cut down or power used to send you ads for things you didn’t want anyway. Economic Savings: Save yourself the temptation of spending money on things you probably didn’t need anyway. Disclaimer: The sudden lack of junk mail may cause some people to feel unloved. Keep a seasonal thermostat. In short, this means keeping your home warmer in the summer and cooler in the winter. Obviously, there is a limit to what comfort will allow, but even a degree or two can save lots of energy – and money off your heating and cooling bill. 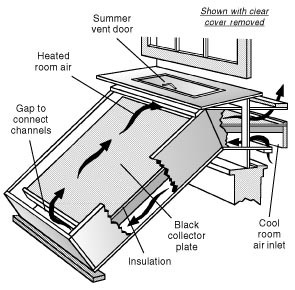 If you don’t have central air, or don’t mind leaving it turned off, a window mounted unit can keep a section of the house frosty in the summer for a lot less energy and cash. Moi’s family uses this. Space heaters and electric blankets in the winter can do the same. Also, consider passive solar heating, which ranges from complex to relative cheap to build at home. Ecological Savings: Reduced energy consumption, which means less fossil fuels being burned. Economic Savings: A good chunk of change off your heating and cooling bills. Disclaimer: May cause cravings for Popsicles in the summer and warm tea in the summer. Turn off and/or unplug unused appliances and electronics. This one sounds pretty obvious, but most people could do more. Turning off appliances (especially lights) when not in use is the best and easiest thing to do. Lamps turned on in empty rooms not only waste energy, but they also wear out the bulb faster and add heat to the house. However, unplugging appliances when not in use can also help. Most appliances draw some power even when not in use. So look around your house. When was the last time you used that blender, and how much has it tacked on to your electricity bill since then? Economic Savings: A good chunk of change off your electricity bills. Disclaimer: May cause confusion in other members of your household when the blender wont turn on. If it’s yellow, let it mellow. Okay okay, I hear your screams of protest. I saved this one for last because I know it is, for many, the least appealing. Yes, I am advocating that you only flush when there is something solid in the bowl. Why? Well, you can cut the number of times you flush by something near half. How much water does your toilet use each flush? Wouldn’t you like to save that amount off your utility bill?If this sounds particularly gross to you, consider this instead. Only follow the practice if A) you live in an area where sewer lines and storm drains are a single system and B) heavy rain or melting is predicted in the near future, occurring, or has recently occurred. This way, you can enjoy flushing away most of the time, and reduce the risk of the sewers backing up or emptying raw sewage into local waterways.Ecological Savings: Reduced water and energy use, lowers the chance of sewers backing up if you use a combined sewer system. Economic Savings: Gallons off your energy bill. Disclaimer: I’m aware that some (most?) women wipe after peeing; I leave it up to your judgment as to when the toilet needs to be flushed to avoid clogging. Also, it may be considered rude to do this when visiting others. You probably guessed that, though. There you go! Do them all. Do one. Heck, do one part of the time. Every little bit helps. This entry was posted on July 31, 2007 at 5:39 pm and is filed under Finance, Green, Life, World. You can follow any responses to this entry through the RSS 2.0 feed. You can leave a response, or trackback from your own site.